5 seconds between me and sub-20:00... and as the picture above taken just after the finish shows, I don't think I had an ounce left to give. I hammered the finishing kick but crossed the line 5 seconds too late. 5 seconds! Gah! When I look back, I will probably think I could have gone just a little faster, but it took a strong finishing kick to even get it this close... 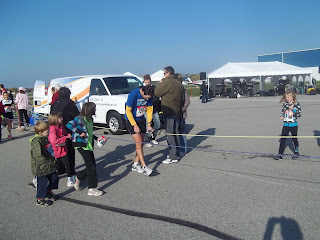 I was averaging 4:01/km for most of the race, and any time I pushed faster I got into that place you can't recover from. I knew I was within seconds, but just couldn't find it. Overall the race was excellent! The kids did the 1k (with my wife), I did the 5k. There was tonnes of loot in the race kits, lots of food at the finish (BBQ, fruit, drinks, everything!). They did a great job organizing the start, putting the "racers" first, then "recreational runners", "speed walkers" and finally "walkers". That was wonderful! And on our second lap, they made sure the walkers kept right so we could run the shortest line without interference. They thought of everything, and the result was a fantastic experience for all abilities and speeds. The runway itself was really cool too... almost like running at the track. Pancake flat and smooth, with only a handful of corners. If you're looking for a fast and fun 5k, this one should be top of the list!